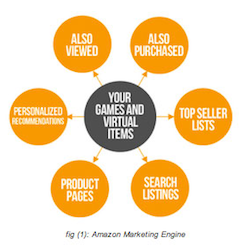 Amazon announced today that consumers can now use their Amazon accounts to purchase virtual goods and currencies in PC, Mac and Web based games, as well as games in the official Amazon app stores for Kindle and Android. As the world’s largest online retailer Amazon already has an enormous amount of users’ payment information. Developers are likely to see benefits as consumers within Amazon’s ecosystem will be able to make in-app purchases with little friction, much like markets in Japan and Korea where carrier billing is the norm. The new in-app purchasing API for PC, Mac and web based games uses the same revenue formula as Amazon’s Kindle Fire store and the Amazon Appstore for Android. Developers earn 70 percent of list price on each paid app as well as on each in-app purchase. Amazon did not specify the revenue share on PC and Mac. The fee for distributing apps through Amazon’s Mobile App Distribution Program is $99 per year, though Amazon is currently waiving that fee. Another interesting benefit of the API is that the in-apps items will also automatically be available on Amazon.com so that they could possible appear on best seller lists. This could potentially greatly increase an app’s visibility and help increase discoverability and user engagement. Developers who are interested in Amazon’s in app-purchasing API can get started here.